Why I read this now: Oh, I was so ready for something FUN. MOTIVATION for READING: Another book that came to me and I didn’t note where/how/whom rec’d. WHAT’s GOOD: All good fun! And I couldn’t figure out a quick answer… If you click on the button above, you can go read her post on her idea to create a list of these books as generated from her book friends. She is allowing us 3 or 4 suggested titles. I would love to say It by Stephen King but I just can’t. I would say the film Shawshank Redemption would be a great one for a movie list like this, though. I haven’t read the short story the movie is based on… But I do think something by Stephen King should be on such a list. I have 974 READ books on goodreads. How many of those did I give 5 stars? 205. Olive Kittredge by Elizabeth Strout? Or did I love Lucy Barton more? I’m not even listing those classics EVERYONE assumes are MUSTs…. Pride and Prejudice, Lord of the Rings, Harry Potter… yikes. What can I say? I have eclectic tastes. AND, I need to read a lot more books. It’s Rooster Obsession Time again – I’ll be trying to read the 15 books I have yet to read before the day in March when it kicks off. I’ve read Lincoln in the Bardo by Geo Saunders, So Much Blue by Percival Everett, and Pachinko by Min Jin Lee. I wouldn’t hesitate to recommend any of these – all enjoyable and/or fascinating. At this point I do not have a favorite and won’t venture a Zombie vote. I know Katie says Exit West is her fave so far, but I know Ruthiella was not so much a fan. The Animators is also a book that is getting love and not-so-much. I’ve seen scathing reviews of The Book of Joan but somebody must like it! All of which will make the commentary in March SO MUCH FREAKIN’ FUN. I’m going to audiobook Sing Unburied Sing and maybe Exit West, too. I will be reading print of The Idiot because the audio sample was ear-aching. I really need to get that library card SOON! My fight for inclusion and lasting change. To see other readers’ first books, visit Sheila’s Book Journey blog. Kitchens of the Great Midwest was terrific! I really enjoyed it. I was saddened to see gr reviews by friends who did NOT like this or read a review that convinced them they would not like it so are crossing off lists! I REALLY liked this book and found much that appealed to my reading emotional self. It’s all just crazy. That’s OK. Too each their own. But I would LOVE to make Joann read this and change her mind and then sit and discuss over wine…. (Wow – I don’t usually try twist peoples’ arms to read a book but it somehow keeps poppin’ up in my recall that she is thinking this won’t appeal to her…) I think that what one reviewer found annoying, I found tongue-in-cheek amusing, so it made me chuckle where the other person reacted with DNF and/or chucking the book across the room. Funny, huh? I thought I missed one book to complete the What’s in a Name Challenge; the the Compass Direction category. A little late in the year for me to start worrying about it, but #shrug. But anyway, I decided to do a look-see through my goodreads My-Books Read list… I searched “North” –> nope, nothing for 2017. I entered “South” –> nothing, again, for 2017. Then “East” –> sure enough –> nada. OK, only one more compass direction to look up, “West”. AND DING DING DING!!! We have a winner! I did not do a dedicated review (in a timely manner, ahem) since I failed miserably at this task for most of the last six months. SO I am here now writing on to satisfy the challenge and give a little jig and celebrate a reading challenge for 2017. Kick up your heels and join me? 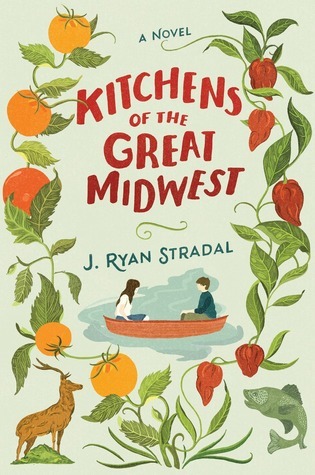 I give j.Ryan Stradal’s Kitchens of the Great Midwest FIVE SLICES of APPLE PIE! Did you have some successes in reading challenges for 2017 that I can help YOU celebrate?